1. Drain the chick peas, reserving the juice. 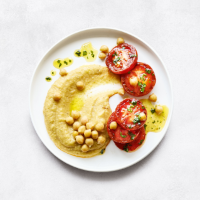 Set 2 tbsp of the chick peas aside and blend the remainder in a food processor with 5 tbsp of the chick pea juice, the cardamom seeds and a little seasoning, until smooth. Turn into a small saucepan and heat through gently while preparing the tomatoes. 2. Heat 1 tbsp of the oil in a frying pan and fry the tomato slices on both sides until slightly softened. Spoon the chick pea purée onto serving plates, top with the tomato slices and reserved whole chick peas. 3. Add the remaining oil, another tablespoon of the chick pea juice, the honey, parsley and a squeeze of lemon to the frying pan. Heat until bubbling then drizzle over the tomatoes to serve.